On the ground floor of the hotel there is a stylish restaurant with a capacity of about 100 seats. 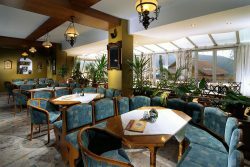 The restaurant is directly connected with the winter garden, which by its design offers a perfect connection of the seating in a restaurant with direct contact with Krkonoše nature. The restaurant offers a rich menu of Czech, regional and international cuisine. There is also a rich wine cellar of domestic and foreign wines and a wide range of spirits.